Israel's ambassador to the UN, Ron Prosor, slams international community's 'poor track record' after it empowers Iranian terror regime. Israel's ambassador to the UN Ron Prosor took on the United Nations Security Council on Monday, just after it unanimously approved a draft resolution implementing the Iranian nuclear deal with the West. "You have awarded a great prize to the most dangerous country in the world," Prosor began. "I hate to be the one to spoil the party, but someone has to say the emperor has no clothes." "Today is a very sad day," he continued, "not only for the State of Israel, but for the entire world. Even at this moment, the international community refuses to see the tragedy." Without checking first to see that Iran is already taking steps to comply with the agreement, passing the draft resolution is "like allowing a criminal to sit on the jury to decide his own fate," Prosor said. "It's not only that you have not cured the symptoms, you have strengthened the source of the problem," he added. "You have given the source of the problem - Iran - money, stability at home, and the time to carry out its destructive ideology." 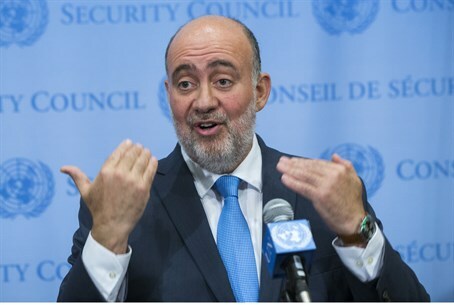 "You in the international community have a bad track record when it comes to seeing impending disasters, even when they are right in front of your eyes," Prosor fired, citing the Arab Spring and the nuclear deal made with North Korea as examples. Prosor presented a map to the audience of "Iran's empire of terror." He noted that such countries as Thailand and Azerbaijan, as well as the US in Washington, D.C., have managed to stop Iran-backed terror plots at the last moment. "You can find Iran's fingerprints in every corner of the world, targeting innocent civilians, smuggling arms, financing terrorist groups, engaging in illegal proliferation activity," he added. "Iran will now have 150 billion dollars to fund terrorist groups," Prosor said. "So the 150 billion question is, what will this map look like tomorrow?" Tova Dvorin contributed to this report.